main movie only, pick which chapter to use for your split point. DVDFAB hack allows processing directly from DVD without having to rip it first. 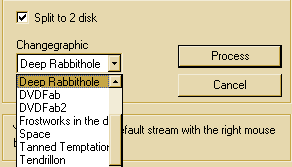 Source Path: point it to your DVD in your DVD-ROM to the VIDEO_TS directory. Destination Path: create a dir, click create new folder, highlight, F2 to rename. Program (PGC) longest in length (main movie) will be automatically selected. Changegraphic you can choose which one you’d like if you installed all CGP’s. You may need to remove RCE protection if you used DVDFAB hack. One possiblity of DVDFAB is to strip out all the extra audio like foreign languages, director’s commentary, subtitles, menus, bonus features, trailers, choosing just widescreen rather than both widescreen and fullscreen, etc. to get the size down below 4.37GB. 4.72GB is over 4.37GB and it shows DVDs 2. If you don’t wish to have a Changegraphic choose <—–> or it’ll show The End with a Changegraphic of your choice. Click Process and it’ll begin processing all files. 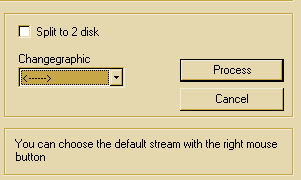 You can choose the default stream with the right mouse button Once you right-click it’ll turn red indicating it’s the default stream. This starts playing Spanish audio without having to switch to it with your remote when you play the movie. Why would you want to do main movie only instead of menus and extras? Perhaps you don’t like FBI warnings, time-consuming menus, etc. DVDShrink can do this movie at level 6 (30%) but for some that may not be good enough. Check Split to 2 disk. Change the chapter split point if you wish. If you have only VTS_01_0.IFO+.BUP and VTS_01_1…n.VOB files, you can create a VIDEO_TS.ifo that fits. In the VIDEO_TS.IFO ( VIDEO-MANAGER) there are a couple of Sectors (Pointers) to the VTS_xx_n-Files. If you change something on the files, you must correct these sectors before you burn otherwise the DVD won’t run on the dvd-player. I’ve seen the max difference between Estimated and Real to be 0.02. Here it is only 0.002. This did help with Spiderman NTSC R1 Fullscreen edition. After analyzing it it dropped the Real size just enough to be able to keep the English subtitles but most of the time you’ll never have to use it. Settings choose between viewing DVDFAB in the following languages: Croation, Dutch, English, French, German, Italian, Spanish. View author of CGPs installed. Italian and croatian translation added. There are no nag screens anymore. Copy complete DVD: Fixed bug if no VIDEO_TS.VOB was available.